The RadPolarChart has one PolarAxis and supports two RadialAxis types that determine the type of data that can be visualized on the chart. 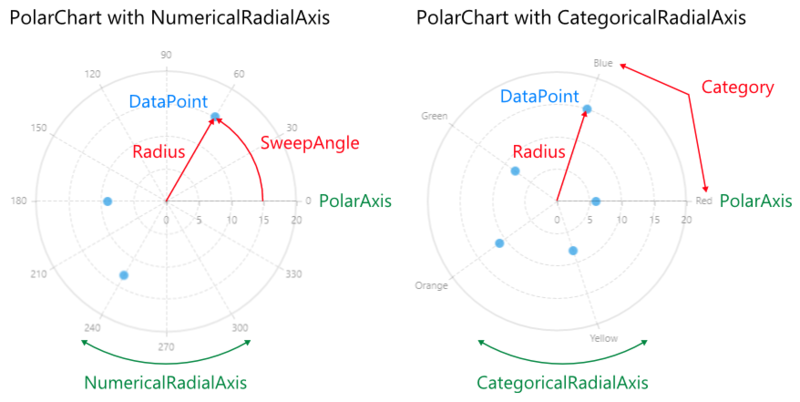 PolarAxis: A special numerical axis used to calculate the Radius value of each data point. Exposes Minimum and Maximum properties to allow explicit definition of the range of values visible on this axis. If these properties are not specified, the axis will automatically calculate the range, depending on the minimum and maximum data point values. NumericalRadialAxis: Used when the data points have angular coordinate. The position of each data point is calculated, depending on the actual numerical value (in degrees) this point provides for the axis. The range of the axis is always from 0 to 360 degrees. CategoricalRadialAxis: Plots the associated data into groups (categories) where the key of each category is the point’s value (if available) for that axis or its index within the points collection if the categorical value is not available. The whole axis is divided into slots for each category and each data point is visualized at angle corresponding to its category. The difference between the two types axes in PolarChart are best demonstrated on the image below. Each RadialAxis supports different types of series. NumericalRadialAxis: Supports numerical series where each DataPoint has radial and angular coordinate - PolarPointSeries and all classes that inherit it. CategoricalRadialAxis: Supports categorical series where each DataPoint has radial coordinate and category - RadarPointSeries and all classes that inherit it.